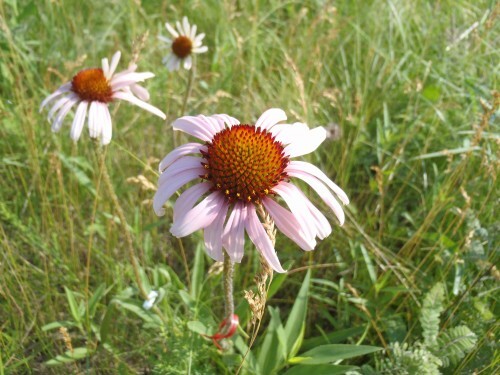 Every year Team Echinacea monitors the timing of flowering, or phenology, of individuals in the experimental plots. Timing matters because both abiotic conditions, such as temperature and photoperiod, and biotic conditions, such as mate availability and pollinator abundance change over the course of a season and may have consequences for reproductive fitness. This study began in 2005 in experimental plot 1 when Jennifer Ison investigated how an individual plant’s timing within a season affected its mating opportunity and reproductive fitness (Ison and Wagenius 2014). A plant is considered flowering when it produces pollen– this head looks like it is on its second day of flowering. Each year, team members identify all plants that are going to flower that year before they begin shedding pollen. We then make regular observations, no more than 3 days apart, of every head on every plant until they are all done flowering. In doing so, we obtain both flowering start and end dates for all flowering heads. We also collect information on any unusual phenological occurrences such as premature end of flowering due to disease, herbivory, or other causes. Location: Experimental Plot 1 (at the research base) and Experimental Plot 2 (at Hegg Lake WMA). Link to flog posts: Read updates and annual reports about this experiment on our flog (field blog) as written by members of Team Echinacea.